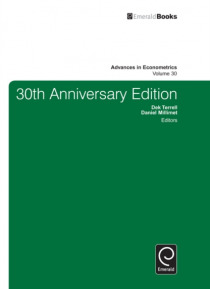 The 30th Volume of Advances in Econometrics is in honor of the two individuals whose hard work has helped ensure thirty successful years of the series, Thomas Fomby and R. Carter Hill. This volume began with a history of the Advances series by Asli Ogunc and Randall Campbell summarizing the prior volumes. Tom Fomby and Carter Hill both provide discussions of the role of Advances over the years. Th… e remaining articles include contributions by a number of authors who have played key roles in the series over the years and in the careers of Fomby and Hill. Overall, this leads to a more diverse mix of papers than a typical volume of Advances in Econometrics.